We are a Verizon family. Always have been, always plan to be. I got my first cell phone in…I think 2001 or 2002. It was a nice little brick. No one was texting yet and my phone was most decidedly NOT smart. In fact it was mostly utilized by my ex boyfriend to call me to tell me he was done bowling, drunk, and needed a ride home every single Friday night. Anyway, I loved my phone. I was the only one of my friends who ever had service pretty much anywhere I went. I live in West Michigan just a stone’s throw from Lake Michigan. Back in the early aughts–ok even now–service can be dicey by the lake and phones are likely to switch to central time randomly because of signals across the lake. It’s annoying. I never had an issue. My friends were jealous. There was a brief time after getting married that Cortney switched me to his Nextel plan. Yes, we were those annoying people with our beeping in to each other. Walkie talkie anyone? We got rid of it because the service BLEW and we like to try not to irritate the world. Back to Verizon we went and since then we have gone from our tiny cute flip phones to those smart phone wanna-be’s (I had the slide out keyboard for texting, yo) to full fledged smart phones. So here we are a social media addicted enthusiast and her tech geek husband. 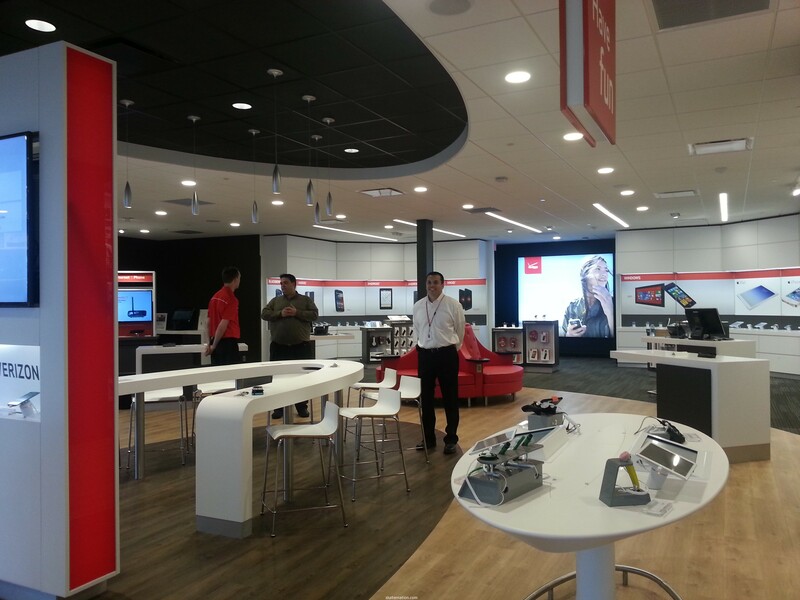 Then I get an invitation to a private tour of the new Verizon Smart Store that is opening in West Michigan. I didn’t even have to think about it that RSVP answer. The Verizon store we have in my city is…um…tiny. Don’t get me wrong, I love Verizon, but the store blows and I do everything I can to NOT go there. I mean when it’s time to upgrade our stuff, we get a sitter because no way in Hades are we taking our children in there. The Smart Store is HUGE. There is no person accosting greeting you at the door and giving you a number. There is no counter of doom where you will wait forever. There are stations to touch and, yes, PLAY with the technology. There is a TON of stock and there is a learning center. Plus check out that comfy red chair thingy. It has chargers in it. They have more stock than a regular store. Rather than 3 ugly generic phone cases, there is a huge WALL of them. And not just limited to iphone things (although they have a ton of those too). Knowledgeable, friendly staff. Ask for my man, Ken. He knows it all. It’s all GREEN! Right down to the paint! Environmentally friendly is the new black. Or something. There is an enormous number of items you can actually hold in your hands. 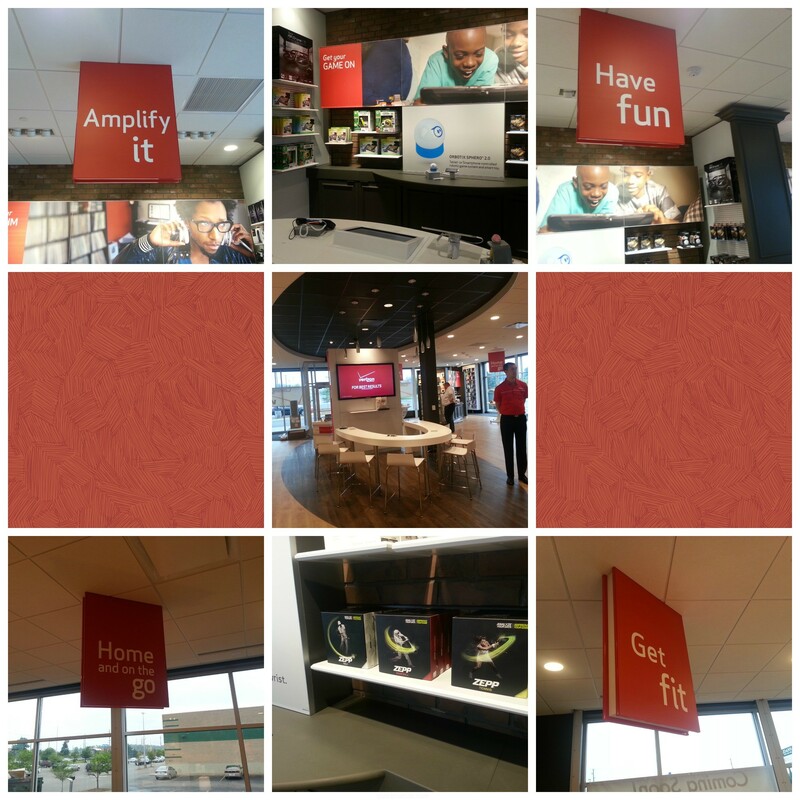 Most stores don’t carry all the FUN stuff the Smart Store does. Four areas to “play”: Audio, Home/Office, Fun, and Fitness. I would TOTALLY take the kids with me to this store. Eddie and Charlie would never walk away from the tablet accessories. A learning center. See the middle picture up there with that horseshoe table thingy? That is a learning center to help beginners know how to turn ON their smart phones or help the tech geek learn more about the gadgets he/she can get to play with his/her phone. Did I mention the stock of cool stuff? Ok, just making sure. I definitely had a fun time poking around at all the cool accessories and technology that is available and I know Cortney is hoping I take him there on a date. Heh. So do you guys have these stores where you are? I had never heard of one before, but I love it! Read more about the Verizon Smart Store on the Verizon website (and see my face!). Sounds like my husband’s idea of heaven! I started with a prepaid phone back in 2000 when my parents decided I needed one when I was driving and then I got a Nextell in 2002 and then my hubby (who also had Nextell) and I switched to Verizon in 2006 when we on the same plan and will also stick with Verizon probably forever, also because of cell coverage issues! When we got phones Nextell was the best by us and now Verizon is. I don’t know how I nursed a baby/stayed awake in the middle of the night without a smartphone!!! I did not know that they had stores like this. I need to bring my sleeping bag and camp out for a week, I think.